Consolidation Period: From October 25, 2018 to the e-Laws currency date. Legislative History: 356/07, 367/09, 236/10 (as am. by 99/15), 435/10, 459/11, 177/12 (as am. by 99/15), 205/14, 89/15, 99/15, 101/15, 188/16, 463/17, 244/18, 455/18. 1. The left lane of the part of the King’s Highway described in a schedule to this Regulation is designated as a high occupancy vehicle lane for the hours, days and months specified in the schedule. O. Reg. 620/05, s. 1. 2. (1) No person shall operate a motor vehicle in a high occupancy vehicle lane unless the vehicle has at least two persons occupying seating positions. O. Reg. 188/16, s. 1. (b) the length of the vehicle or the total length of the vehicle and any vehicle being towed by it is less than 6.5 metres. O. Reg. 188/16, s. 1. 1. The vehicle is a bus. 2. The person is operating an emergency vehicle, as defined in section 144 of the Act, in the performance of his or her duties. 3. The person is operating the vehicle in the lawful performance of his or her duties as a police officer. 4. The person is operating a vehicle owned or leased by the Province of Ontario in the lawful performance of his or her duties as an officer appointed for carrying out the provisions of the Act. 5. The person is operating a vehicle engaged in road construction or maintenance activities in or near the high occupancy vehicle lane. 6. The person is operating a tow truck that has been requested to provide towing or repair services to a disabled vehicle in or near a high occupancy vehicle lane by a police officer, an officer appointed for carrying out the provisions of the Act or a person driving the disabled vehicle, and operating the tow truck in the high occupancy vehicle lane is necessary to attend at and depart from the location of the disabled vehicle. iii. display the words “GREEN VEHICLE” or “VÉHICULE ÉCOLOGIQUE”. ii. has mounted on the rear of the vehicle a valid plate bearing an identification number issued by the municipality or airport authority for the use of the vehicle for that purpose. O. Reg. 188/16, s. 1. (4) Paragraph 8 of subsection (3) and this subsection are revoked on July 1, 2020. O. Reg. 188/16, s. 1; O. Reg. 244/18, s. 1. 3. (1) Entry and exit points at which vehicles may enter or exit high occupancy vehicle lanes are located between buffer zones, illustrated in Figure A in section 4. O. Reg. 620/05, s. 3 (1). 1. The person is directed to make the movement by a police officer. 6. The person is operating a tow truck that has been requested to provide towing or repair services to a disabled vehicle in or near a high occupancy vehicle lane by a police officer, an officer appointed for carrying out the provisions of the Act, or a person driving the disabled vehicle, and crossing the buffer zone is necessary to attend at and depart from the location of the disabled vehicle. 7. The person is complying with the requirements of section 159 of the Act. O. Reg. 620/05, s. 3 (2); O. Reg. 99/15, s. 1 (1-3). (3) Subsection 148 (2) of the Act does not apply to a person operating a vehicle in a high occupancy vehicle lane. O. Reg. 620/05, s. 3 (3). (4) Revoked: O. Reg. 99/15, s. 1 (5). 1. Painted white diamond markings on the surface of the roadway of the high occupancy vehicle lane, placed periodically along the length of the lane. 2. Painted white buffer zone markings on the surface of the roadway separating high occupancy vehicle lanes from other highway lanes. 3. Painted white continuity lane markings on the surface of the roadway between buffer zones indicating points at which vehicles may enter or exit a high occupancy vehicle lane. Text alternative: Illustration of “Figure A” showing an overhead plan of a divided highway with the high occupancy vehicle lane as the leftmost lane on a highway. The lane has white diamond markings on the roadway and broken white lines indicating the entry and exit points. Diagonal lines painted between solid lines before and after the entry and exit points indicate the buffer between the high occupancy vehicle lane and the lane beside it. The left shoulder is indicated to the left of the high occupancy vehicle lane. This text alternative is provided for convenience only and does not form part of the official law. O. Reg. 620/05, s. 4; O. Reg. 89/15, s. 1. 5. 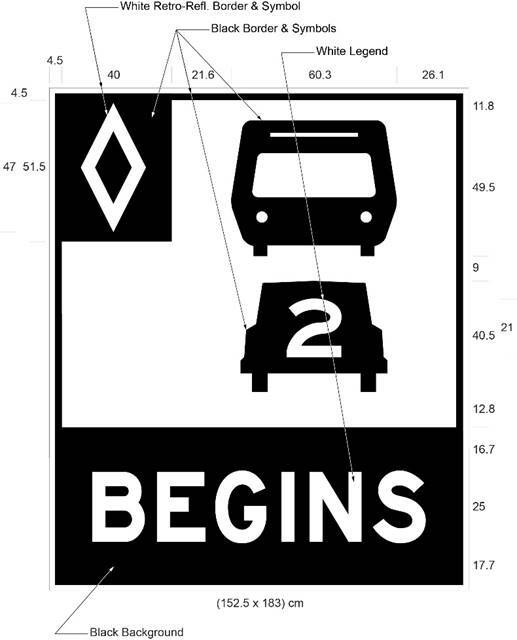 (1) The commencement of a high occupancy vehicle lane shall be indicated by an overhead sign that has the dimensions and bears the markings as illustrated in Figure B. Text alternative: Illustration of an overhead high occupancy vehicle lane sign labelled as “Figure B”. The sign contains three rectangles, stacked on top of one another. The top rectangle has a white reflective background and contains a symbol of a bus on top of a symbol of a car with the number “2” inside it. A white diamond shape in a small black rectangle appears in the upper left corner of this rectangle. The middle rectangle contains the word “BEGINS” in white letters on a reflective black background. The bottom rectangle has a white reflective background and contains a thick black arrow pointing down. The following measurements are written below the sign: (152.5 x 213.5) cm. The sign is surrounded by measurements of its different elements. This text alternative is provided for convenience only and does not form part of the official law. O. Reg. 620/05, s. 5 (1); O. Reg. 89/15, s. 2 (1). 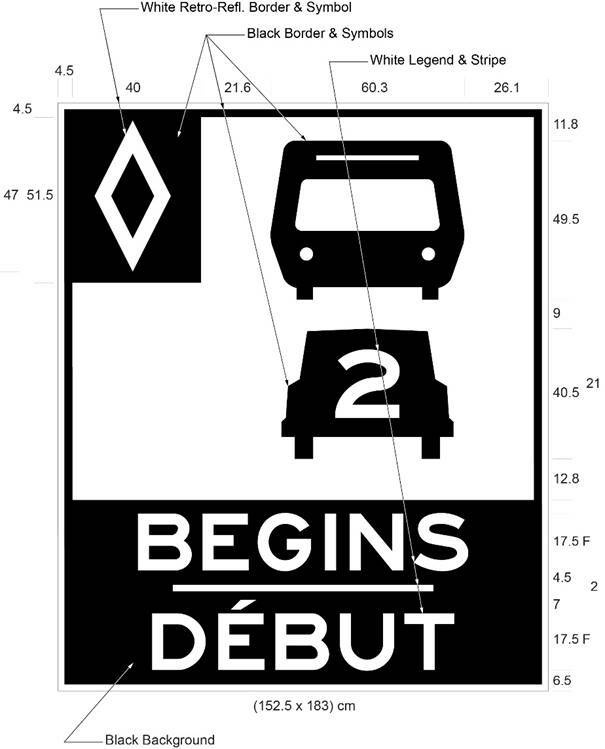 (2) Despite subsection (1), in an area designated in the Schedule to the French Language Services Act, the commencement of a high occupancy vehicle lane shall be indicated by an overhead sign that has the dimensions and bears the markings as illustrated in Figure C.
Text alternative: Illustration of an overhead high occupancy vehicle lane sign labelled as “Figure C”. The sign contains three rectangles, stacked on top of one another. The top rectangle has a white reflective background and contains a symbol of a bus on top of a symbol of a car with the number “2” inside it. A white diamond shape in a small black rectangle appears in the upper left corner of this rectangle. The middle rectangle contains the word “BEGINS/DÉBUT” in white letters on a reflective black background. The bottom rectangle has a white reflective background and contains a thick black arrow pointing down. The following measurements are written below the sign: (152.5 x 213.5) cm. The sign is surrounded by measurements of its different elements. This text alternative is provided for convenience only and does not form part of the official law. O. Reg. 620/05, s. 5 (2); O. Reg. 89/15, s. 2 (2). Text alternative: Illustration of an overhead high occupancy vehicle lane sign labelled as “Figure D”. The sign has a white reflective background and contains a symbol of a bus on top of a symbol of a car with the number “2” inside it, below which appears a thick black arrow pointing down. A white diamond shape in a small black rectangle appears in the upper left corner of this rectangle. The following measurements are written below the sign: (152.5 x 183) cm. The sign is surrounded by measurements of its different elements. This text alternative is provided for convenience only and does not form part of the official law. O. Reg. 620/05, s. 5 (3); O. Reg. 89/15, s. 2 (3). (4) High occupancy vehicle lane signs shall not be more than four kilometres apart from each other. O. Reg. 620/05, s. 5 (4). 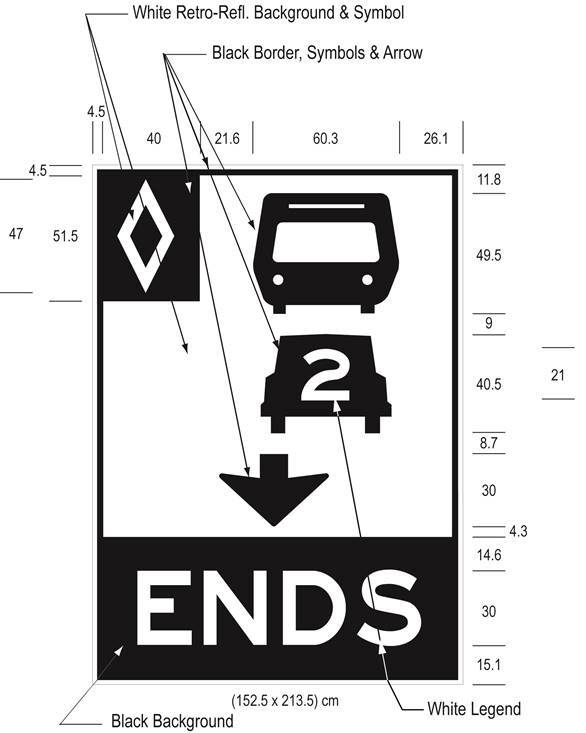 (5) The end of a high occupancy vehicle lane shall be indicated by an overhead sign that has the dimensions and bears the markings as illustrated in Figure E or by a ground mounted sign that has the dimensions and bears the markings as illustrated in Figure F.
Text alternative: Illustration of an overhead high occupancy vehicle lane sign labelled as “Figure E”. The sign contains two rectangles, stacked on top of one another. The top rectangle has a white reflective background and contains a symbol of a bus on top of a symbol of a car with the number “2” inside it, below which appears a thick black arrow pointing down. A white diamond shape in a small black rectangle appears in the upper left corner of this rectangle. The bottom rectangle contains the word “ENDS” in white letters on a reflective black background. The following measurements are written below the sign: (152.5 x 213.5) cm. The sign is surrounded by measurements of its different elements. This text alternative is provided for convenience only and does not form part of the official law. Text alternative: Illustration of a ground mounted high occupancy vehicle lane sign labelled as “Figure F”. The sign contains two rectangles, stacked on top of one another. 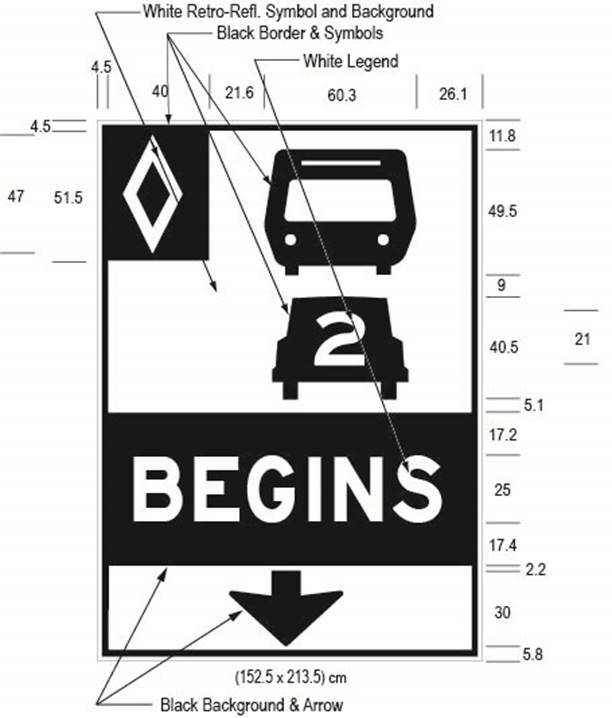 The top rectangle has a white reflective background and contains a symbol of a bus on top of a symbol of a car with the number “2” inside it. A white diamond shape in a small black rectangle appears in the upper left corner of this rectangle. The bottom rectangle contains the word “ENDS” in white letters on a reflective black background. The following measurements are written below the sign: (152.5 x 183) cm. The sign is surrounded by measurements of its different elements. This text alternative is provided for convenience only and does not form part of the official law. O. Reg. 620/05, s. 5 (5); O. Reg. 89/15, s. 2 (4). 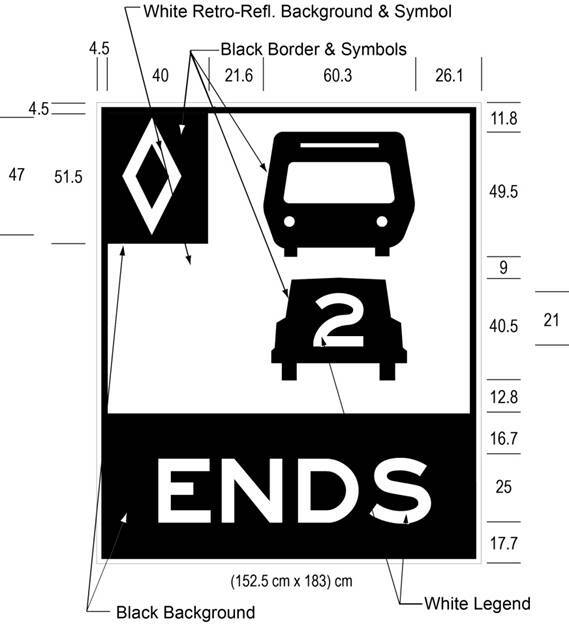 (6) Despite subsection (5), in an area designated in the Schedule to the French Language Services Act, the end of a high occupancy vehicle lane shall be indicated by an overhead sign that has the dimensions and bears the markings as illustrated in Figure G or by a ground mounted sign that has the dimensions and bears the markings as illustrated in Figure H.
Text alternative: Illustration of an overhead high occupancy vehicle lane sign labelled as “Figure G”. The sign contains two rectangles, stacked on top of one another. 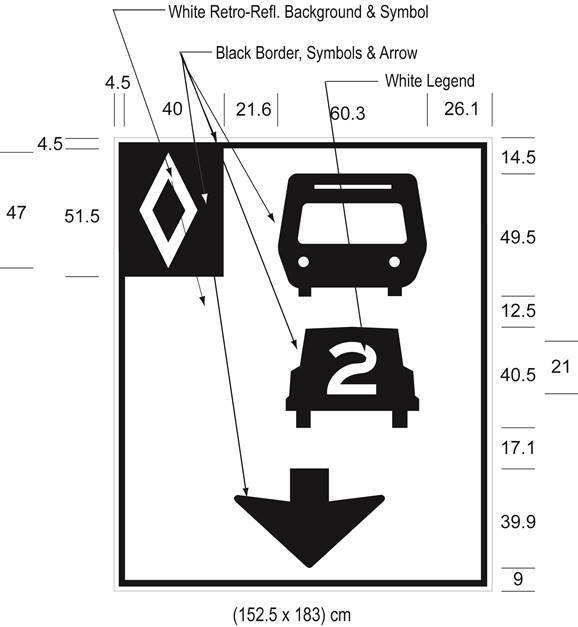 The top rectangle has a white reflective background and contains a symbol of a bus on top of a symbol of a car with the number “2” inside it, below which appears a thick black arrow pointing down. A white diamond shape in a small black rectangle appears in the upper left corner of this rectangle. The bottom rectangle contains the word “ENDS/FIN” in white letters on a reflective black background. The following measurements are written below the sign: (152.5 x 213.5) cm. The sign is surrounded by measurements of its different elements. This text alternative is provided for convenience only and does not form part of the official law. Text alternative: Illustration of a ground mounted high occupancy vehicle lane sign labelled as “Figure H”. The sign contains two rectangles, stacked on top of one another. The top rectangle has a white reflective background and contains a symbol of a bus on top of a symbol of a car with the number “2” inside it. A white diamond shape in a small black rectangle appears in the upper left corner of this rectangle. 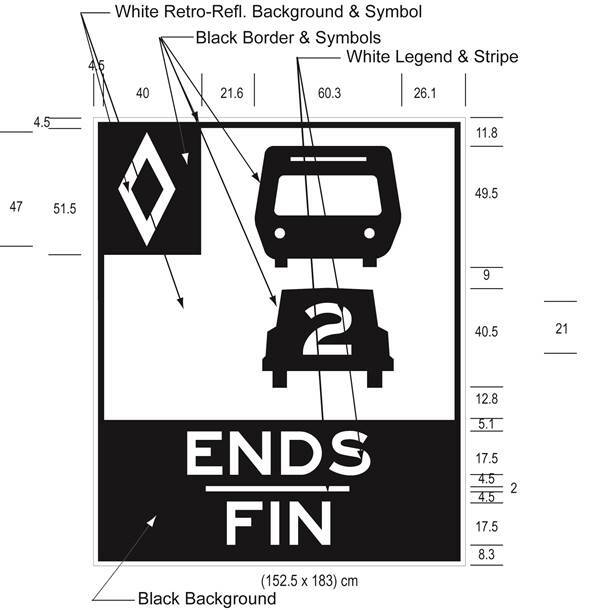 The bottom rectangle contains the word “ENDS/FIN” in white letters on a reflective black background. The following measurements are written below the sign: (152.5 x 183) cm. The sign is surrounded by measurements of its different elements. This text alternative is provided for convenience only and does not form part of the official law. O. Reg. 620/05, s. 5 (6); O. Reg. 89/15, s. 2 (5). (b) Figure K or L, if the sign is a ground mounted sign. Text alternative: Illustration of an overhead buffer zone sign labelled as “Figure I”. The sign contains an image on the left of a buffer zone as diagonal lines painted between solid lines and on the right contains the words “Do Not Cross”. The sign has a white reflective background with the buffer zone image and words appearing in black. The following measurements are written below the sign: (152.5 x 152.5) cm. The sign is surrounded by measurements of its different elements. This text alternative is provided for convenience only and does not form part of the official law. Text alternative: Illustration of an overhead buffer zone sign labelled as “Figure J”. 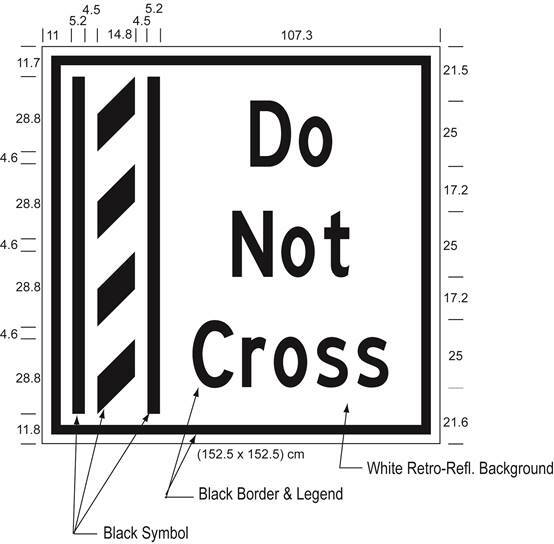 The sign contains an image on the right of a buffer zone as diagonal lines painted between solid lines and on the left contains the words “Do Not Cross”. The sign has a white reflective background with the buffer zone image and words appearing in black. The following measurements are written below the sign: (152.5 x 152.5) cm. The sign is surrounded by measurements of its different elements. This text alternative is provided for convenience only and does not form part of the official law. Text alternative: Illustration of a ground mounted buffer zone sign labelled as “Figure K”. The sign contains an image on the left of a buffer zone as diagonal lines painted between solid lines and on the right contains the words “Do Not Cross”. The sign has a white reflective background with the buffer zone image and words appearing in black. The following measurements are written below the sign: (90 x 120) cm. The sign is surrounded by measurements of its different elements. This text alternative is provided for convenience only and does not form part of the official law. Text alternative: Illustration of a ground mounted buffer zone sign labelled as “Figure L”. 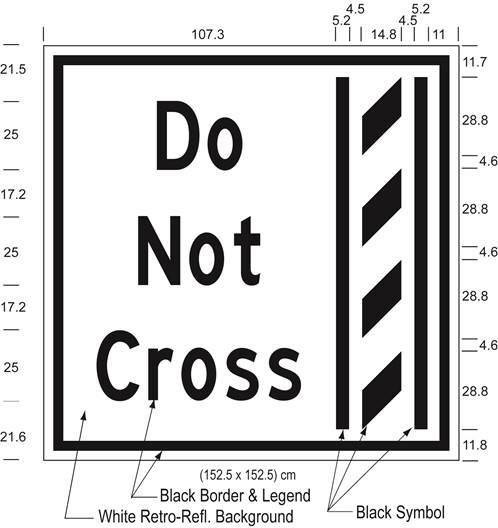 The sign contains an image on the right of a buffer zone as diagonal lines painted between solid lines and on the left contains the words “Do Not Cross”. The sign has a white reflective background with the buffer zone image and words appearing in black. The following measurements are written below the sign: (90 x 120) cm. The sign is surrounded by measurements of its different elements. This text alternative is provided for convenience only and does not form part of the official law. O. Reg. 620/05, s. 5 (7); O. Reg. 89/15, s. 2 (6). (b) Figure O or P, if the sign is a ground mounted sign. Text alternative: Illustration of an overhead buffer zone sign labelled as “Figure M”. The sign contains an image on the left of a buffer zone as diagonal lines painted between solid lines and on the right contains the words “Do Not Cross/Ne pas traverser”. The sign has a white reflective background with the buffer zone image and words appearing in black. The following measurements are written below the sign: (152.5 x 152.5) cm. The sign is surrounded by measurements of its different elements. This text alternative is provided for convenience only and does not form part of the official law. Text alternative: Illustration of an overhead buffer zone sign labelled as “Figure N”. 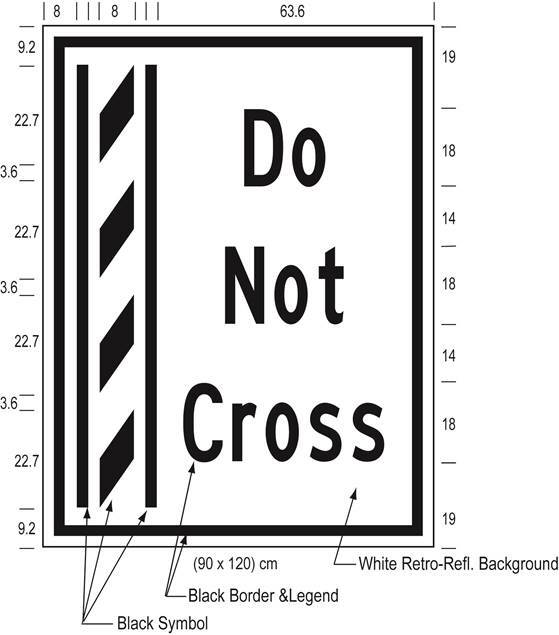 The sign contains an image on the right of a buffer zone as diagonal lines painted between solid lines and on the left contains the words “Do Not Cross/Ne pas traverser”. The sign has a white reflective background with the buffer zone image and words appearing in black. The following measurements are written below the sign: (152.5 x 152.5) cm. The sign is surrounded by measurements of its different elements. This text alternative is provided for convenience only and does not form part of the official law. Text alternative: Illustration of a ground mounted buffer zone sign labelled as “Figure O”. The sign contains an image on the left of a buffer zone as diagonal lines painted between solid lines and on the right contains the words “Do Not Cross/Ne pas traverser”. The sign has a white reflective background with the buffer zone image and words appearing in black. The following measurements are written below the sign: (90 x 120) cm. The sign is surrounded by measurements of its different elements. This text alternative is provided for convenience only and does not form part of the official law. Text alternative: Illustration of a ground mounted buffer zone sign labelled as “Figure P”. The sign contains an image on the right of a buffer zone as diagonal lines painted between solid lines and on the left contains the words “Do Not Cross/Ne pas traverser”. The sign has a white reflective background with the buffer zone image and words appearing in black. The following measurements are written below the sign: (90 x 120) cm. The sign is surrounded by measurements of its different elements. This text alternative is provided for convenience only and does not form part of the official law. O. Reg. 620/05, s. 5 (8); O. Reg. 89/15, s. 2 (7). (9) The dimensions of a sign may differ from those prescribed in this section as long as the dimensions are in the same proportion to each other as the dimensions prescribed in this section are to each other. O. Reg. 620/05, s. 5 (9). (10) An overhead sign shall be erected directly above the high occupancy vehicle lane and a ground mounted sign shall be erected on the side of the highway facing approaching traffic. O. Reg. 620/05, s. 5 (10). 6. Revoked: O. Reg. 99/15, s. 2 (2). 7.-10. Revoked: O. Reg. 99/15, s. 2 (3). 1. (1) That part of the King’s Highway known as No. 404 (southbound) lying between a point situate 1,100 metres measured southerly from its intersection with the centre line of the roadway known as 16th Avenue in The Regional Municipality of York, and a point situate 1,090 metres measured southerly from its intersection with the centre line of the roadway known as Sheppard Avenue in the City of Toronto. (2) That part of the King’s Highway known as No. 404 (northbound) lying between a point situate 210 metres measured northerly from its intersection with the centre line of the roadway known as Van Horne Avenue in the City of Toronto and a point situate 567 metres measured southerly from its intersection with the centre line of the roadway known as Regional Road Highway 7 in The Regional Municipality of York. (3) This designation is effective 24 hours a day, seven days a week and every month of the year. (4) Revoked: O. Reg. 99/15, s. 3 (2). O. Reg. 620/05, Sched. A; O. Reg. 356/07, s. 1; O. Reg. 99/15, s. 3. 1. (1) That part of the King’s Highway known as No. 403 (eastbound) in the City of Mississauga in The Regional Municipality of Peel lying between a point situate 886 metres measured westerly from its intersection with the centre line of the roadway known as Winston Churchill Boulevard, and a point situate 30 metres measured southerly from its intersection with the centre line of the roadway known as Matheson Boulevard. (2) That part of the King’s Highway known as No. 403 (westbound) in the City of Mississauga in The Regional Municipality of Peel lying between a point situate 150 metres measured southerly from its intersection with the centre line of the roadway known as Matheson Boulevard and a point situate 520 metres measured easterly from its intersection with the centre line of the roadway known as Winston Churchill Boulevard. 2. (1) That part of the King’s Highway known as No. 403 (eastbound) in the City of Mississauga in The Regional Municipality of Peel lying in the collector lanes between a point situate 600 metres measured southerly from its intersection with the centre line of the roadway known as Matheson Boulevard and a point situate at its intersection with the King’s Highway known as No. 401. (2) This designation is effective 24 hours a day, seven days a week and every month of the year. O. Reg. 620/05, Sched. B; O. Reg. 455/18, s. 1. 1. (1) That part of the King’s Highway known as No. 417 (eastbound) in the City of Ottawa lying between a point situate 415 metres measured westerly from its intersection with the centre line of the roadway known as Palladium Drive and a point situate 14 metres measured westerly from its intersection with the centre line of the roadway known as Moodie Drive. 2. (1) That part of the King’s Highway known as No. 417 (westbound) in the City of Ottawa lying between a point situate 1,105 metres measured westerly from its intersection with the centre line of the roadway known as Moodie Drive and a point situate 465 metres measured easterly from its intersection with the centre line of the roadway known as Palladium Drive. O. Reg. 205/14, s. 1. 1. (1) That part of the King’s Highway known as Queen Elizabeth Way and No. 403 (eastbound) in The Regional Municipality of Halton lying between a point situate 39 metres measured westerly from its intersection with the centre line of the roadway known as Guelph Line in the City of Burlington and a point situate 101 metres measured westerly from its intersection with the centre line of the roadway known as Trafalgar Road in the Town of Oakville. (2) That part of the King’s Highway known as Queen Elizabeth Way/Highway 403 (westbound) in The Regional Municipality of Halton lying between a point situate 185 metres measured easterly from its intersection with the centre line of the roadway known as Trafalgar Road and in the Town of Oakville and a point situate 380 metres measured easterly from its intersection with the centre line of the roadway known as Guelph Line in the City of Burlington. (4) Revoked: O. Reg. 99/15, s. 4 (2). O. Reg. 435/10, s. 1; O. Reg. 459/11, s. 1; O. Reg. 99/15, s. 4. 1. (1) That part of the King’s Highway known as No. 427 (southbound) in the City of Toronto lying between a point situate 70 metres measured northerly from its intersection with the centre line of the roadway known as Morning Star Drive and a point situate 500 metres measured southerly from its intersection with the centre line of the King’s Highway known as No. 409. O. Reg. 463/17, s. 1. 1. (1) That part of the King’s Highway known as No. 410 (northbound) in The Regional Municipality of Peel lying between a point situate at its intersection with the King’s Highway known as No. 401 in the City of Mississauga and a point situate 350 metres measured southerly from its intersection with the centre line of the roadway known as Clark Boulevard in the City of Brampton. (2) That part of the King’s Highway known as No. 410 (southbound) in The Regional Municipality of Peel lying between a point situate 40 metres measured northerly from its intersection with the centre line of the roadway known as Glidden Road in the City of Brampton and a point situate 800 metres measured northerly from its intersection with the centre line of the King’s Highway known as No. 401 in the City of Mississauga. O. Reg. 455/18, s. 2. Schedule G Revoked: O. Reg. 99/15, s. 5 (2).